Black Rhinos differ from their African cousins, the White Rhinos in having hooked lips, as opposed to the wide lips of the White Rhino. Excessive poaching for the Black Rhinoceros' horn have decimated its numbers, with several sub-species already extinct. The Western Black Rhinoceros was recently pronounced extinct by the IUCN following a 2011 survey. The political crises in several African countries that fall in the range of the Black Rhino have only made the situation worse. 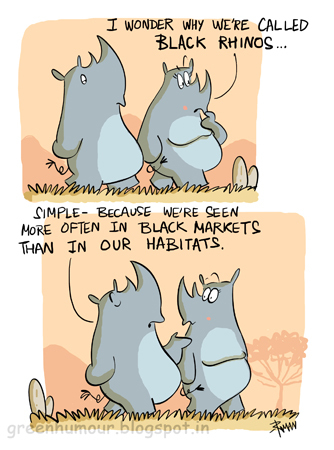 Here's this year's World Rhino Day post!